Visit AILET official website and click on New Registration. Create a Login Account with Email ID, Name, Date of Birth and Phone Number, click on the submit button. Enter Personal, Academic, Mailing Address, and Guardian details etc. Upload scanned photograph, and signature. Complete the payment through Online or Post Office. Mode: Applications for this AILET 2019 test will be accepted in online mode only. Official site: Applicants must visit the official website of National Law University and register to appear for the AILET 2019 examination. Step 1: Visiting the Official site. Official site: The candidates have to first visit the Official site of AILET 2019 and register for a new account. Here the candidates have to enter their information such as email id, password, name, DOB, Parents name, address etc. Step 3: Select the college. 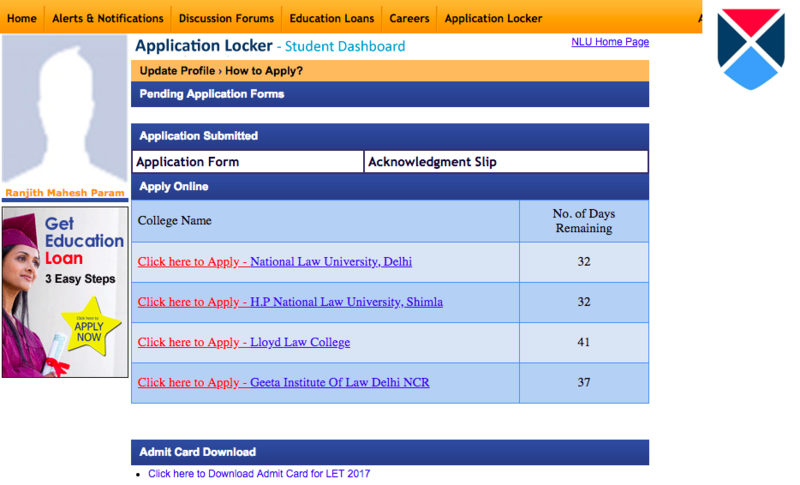 The candidates have to choose the institute name i.e., National Law University, Delhi and should click on the link beside it. Step 4: Selecting the Course. The candidates have to select the course to which they are applying (BA.LLB/LLM/PhD). Here the candidates have to enter their personal information such as their Gender, Category, Religion, National, should select their preferred exam location and should upload their Photograph and Signature in JPEG format. Here the candidates have to enter their address and mobile number. Here the candidates have to enter their family member details. 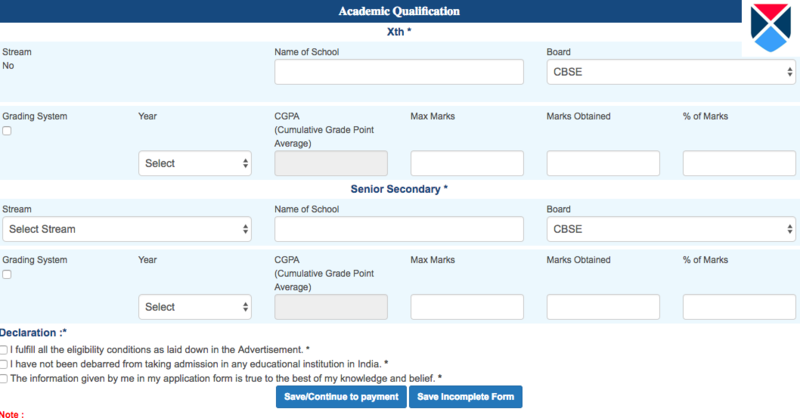 The candidates should enter the academic details such as 10th and 12th details. After filling the AILET 2019 Application form, the candidates have to select the payment method (either Offline or Online) and complete the payment.. Applications for this AILET test will be accepted in online mode only. Applicants must visit the official website of National Law University and register to appear for the AILET examination. 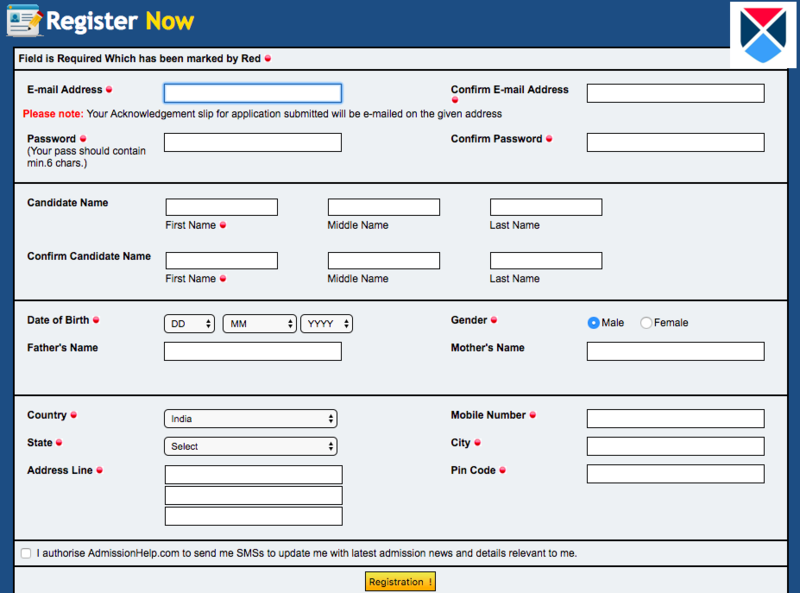 After the AILET registration process, applicants are now ready to fill the AILET application form. Applicants must click on AILET 2017 and fill up the basic details correctly to register for AILET 2017. AILET Applicants are required to fill up their personal, qualification and other details as mentioned in the AILET application form. To complete the procedure, applicants need to pay their application fees through DD in favor of Registrar, National Law University, Delhi payable at Delhi. How do I pay for the application fees of AILET? The DD acquired should be payable at Delhi. Should I pay the AILET application fees through DD? Yes, the candidates should pay the AILET 2017 application fees through DD in favour of Registrar, National Law University, Delhi payable at Delhi. Can you brief me about the AILET 2017 application process? The candidates can apply online only. Candidates have to visit the Official website and register for the exam. The candidate has to to click on the AILET 2017 link and fill up his/her basic details. The candidate has to enter their personal, educational and other details. Finally candidates need to pay their application fees through DD in favour of Registrar, National Law University, Delhi payable at Delhi. What kind of details am I supposed to fill in the application form for AILET? How can i apply for AILET? Applicants must vist www.nludelhi.ac.in/ and register for AILET. 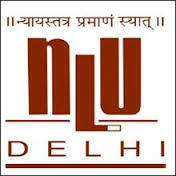 To complete the procedure, applicants need to pay their application fees through DD in favour of Registrar, National Law University, Delhi payable at Delhi. Where can I find the link to go to the login page directly for AILET? When is the last date of Application form Submission? Last Date to Submit AILET Application Forms is 1st week of April 2017. Where should I submit the duly completed application form AILET? The application complete in all respect shall be submitted to the website. Can I apply for the AILET 2017 offline? No, you cannot apply for the AILET 2017 offline.